On dolls and scales and magazines…. One of the focuses of my business is dollhouse miniatures… to answer the questions on scale. 1/2″ or 1/24 scale is smaller and has gained popularity in the last couple of years. The reason for this is the 1″ scale people are running out of space for minis! This is a niche market that has a growing base. I’m not saying 1″ scale is on it’s way out just that 1/2″ is growing in popularity due to the main body of crafters being retired or *my* elders (I’m not yet 40) and on space and money budgets that are shrinking. 1/4 scale is also popular but I’m not up on it much but I can say it is extremely tiny … if you’ve ever seen the original 80’s Poly Pockets those come close to the correct scale or a Z scale train is right. This is a dollhouse scale for inside a 1″ scale dollhouse! On the larger end of the scale is 1/6 scale which is Barbie and the number of adult collectors wishing there were more things for her that weren’t Barbie Pink has a huge base. Then there is the Tonner and larger 15-18″ fashion dolls that would dearly love more items including houses and such for their dolls. and a whole host of other magazines that deal with various subjects within the doll or miniature world. I’ve been into dolls since 1988 when my mom started her doll business. I have been seriously into collector dolls and miniatures for about the last 8 years. 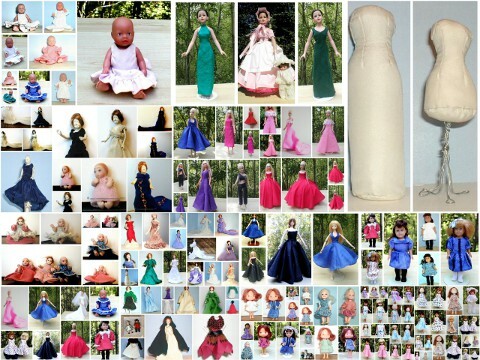 I should also add in something about reborn dolls, re-painted dolls and art dolls… there are lots of those out there too.Those who redo, repaint or sculpt their own dolls that need and use props… you might just have a niche in one of these categories. I am incredibly excited… for the first time in over a year I bought myself a new doll. Having a red headed Gene standing here in her undies staring at me is slowly motivating me to dig out my closets again and play with patterns & fabric and slowly start putting things back online. My Advanced Discourse class is inspiring me to write again and I am updating all my blogs and may even tackle updating some small portions of my website as time allows. Hopefully soon… very soon I’ll have a new outfit to show off… if not for a doll then for myself as I am really itching to sew and craft once more. As I work here in my little studio I’ve discovered a few things…. testing in ‘real fabric’ vs muslin is an OK thing to do at least for larger dolls. My reasoning behind this is that if a pattern doesn’t turn out just right for say Kitty the same pattern with minor modifications manages nicely to fit a smaller doll like Brenda Starr. Besides that the ‘goofs’ are perfect to give to my daughter to play with as she doesn’t mind imperfections in my work that usually go with a first run through a pattern as I draft and redraft and sew and re-sew a project. It’s funny I start with a design for one doll and eventually I have the same design or a variation of it for 2 or more others as well. I just love designing and sewing for my dolls.